VINTAGE COSTUME ESTATE ANTIQUE JEWELRY EARRINGS! Seed Faux Pearl Golden Glass Tube Vintage Dangle Clip Earrings For Weddings, Proms, Pageants And Parties! 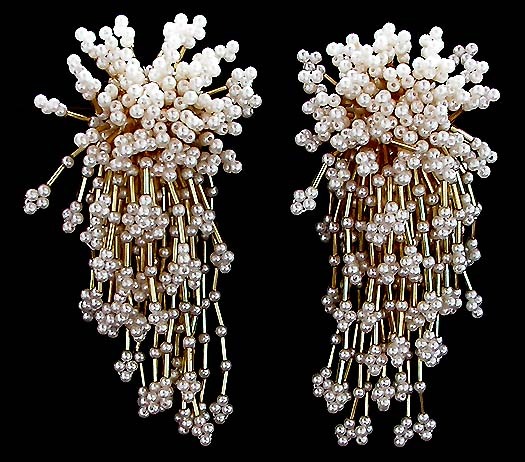 Item #E168181 - Seed Faux Pearl Golden Glass Tube Vintage Dangle Clip Earrings. Size: Length: 4". Width: 2". Absolutely spectacular! These shockingly beautiful earrings are big, bold and daring. They don't conform to any rules! The golden glass tubed luxuriant seed faux pearl strands on top bursting open wildly like fire work demanding attention. Then contrasting sharply is the forocious cascade of golden glass tubed faux pearl strands! This voluptous beauty passionately wants to make a statement! Clip backs. Excellent Condition. Fabulous earrings for weddings, proms, parties and special functions! US$128.00. SOLD.